The growth of a firm is highly reliant on and centers on its sales growth. More often than not when a firm starts to strategize and plan for their growth, they end up allocating more resources and investments toward growing their operations including equipping their staff better, improving production, efficiency etc.. However, such firms may miss the basic premise of auditing their sales growth. Also, since improving sales involves a multi-pronged approach rather than single policy amendments, auditing such a system requires much more effort from project managers and staff alike. 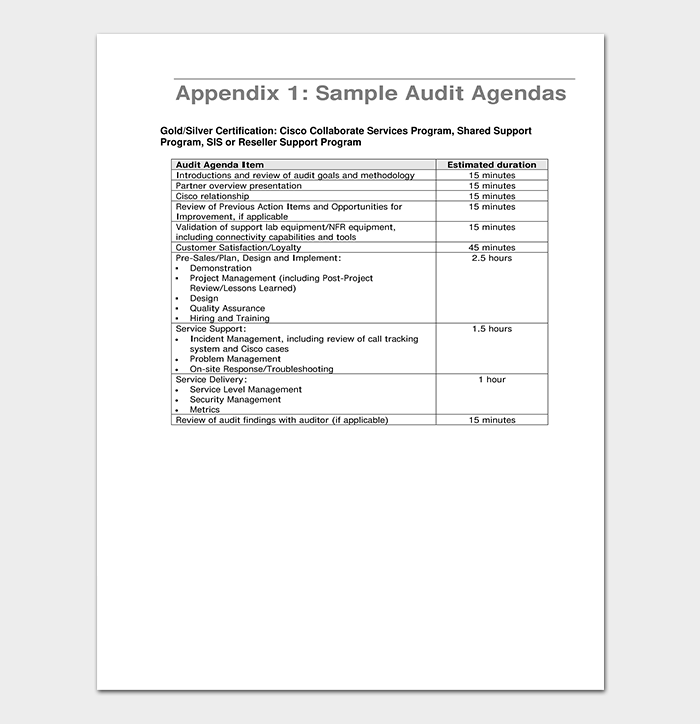 An audit agenda template can make the whole process easier and more relevant for the firm. A template will enable the firm to approach their operations in a more objective way, hence removing ambiguity and confusion. 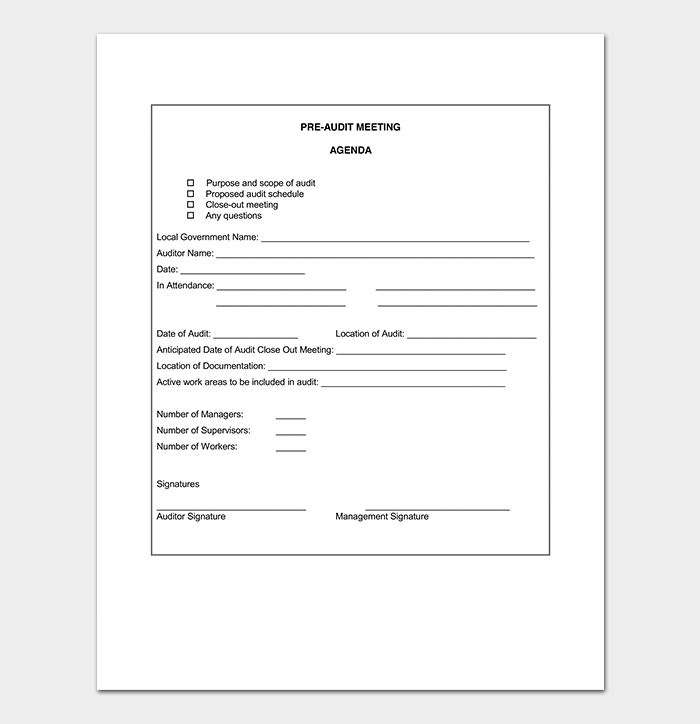 An internal audit meeting agenda template is a template that covers all the basic points of discussion in the event the firm’s concerned audit departments meet to strategize on the way forward. 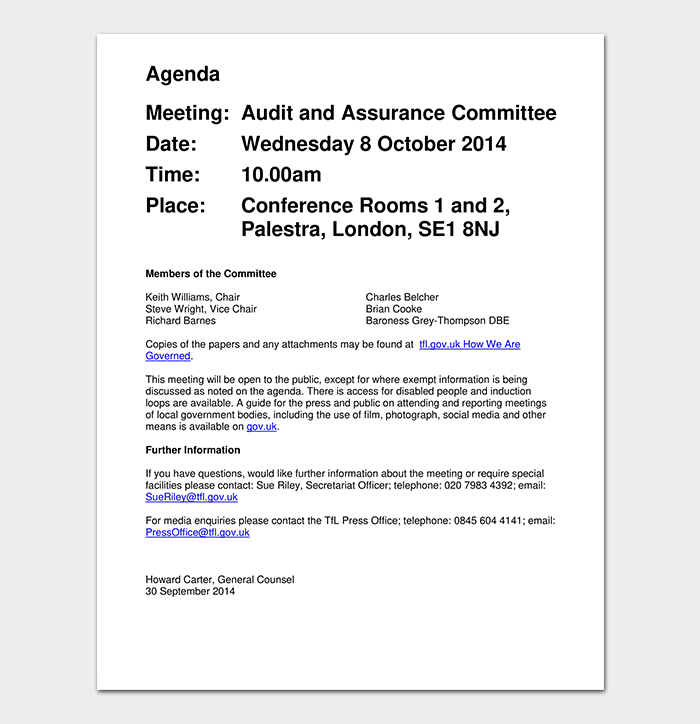 It is important to remember that an audit meeting basically takes place when the auditing team meets the auditee. The primary purpose behind such a meeting is to discuss about the audit plan and in general familiarize the auditee regarding the auditing process. 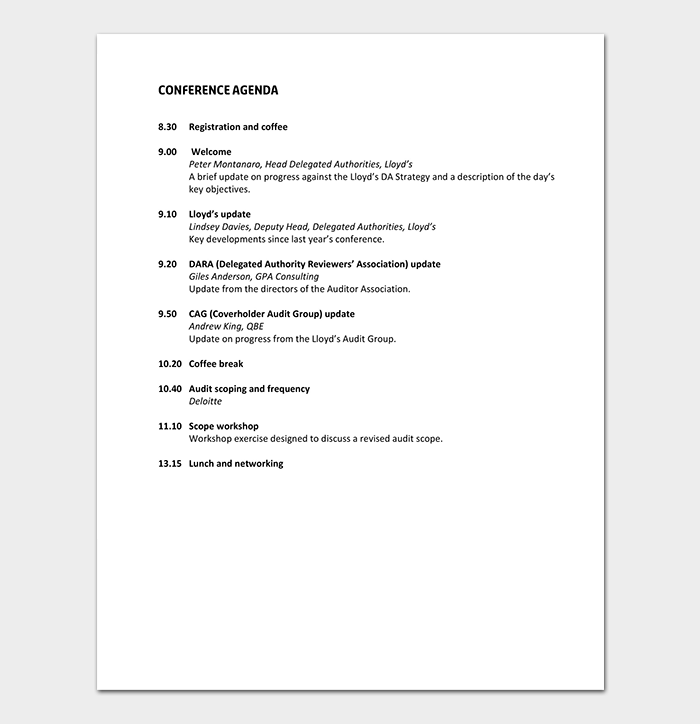 An audit meeting agenda template will usually list everything the auditor would need to know before starting work. This information gathering process is very important in devising a good audit plan. The auditing team members and their roles are also described in detail to the auditee group in an audit meet. The auditor in this case will be on the firm’s payroll and is a part of the firm for all practical reasons since it’s an internal audit. This part of the process is imperative in that the broader process helps the auditor in gaining as much knowledge regarding the auditee as possible. 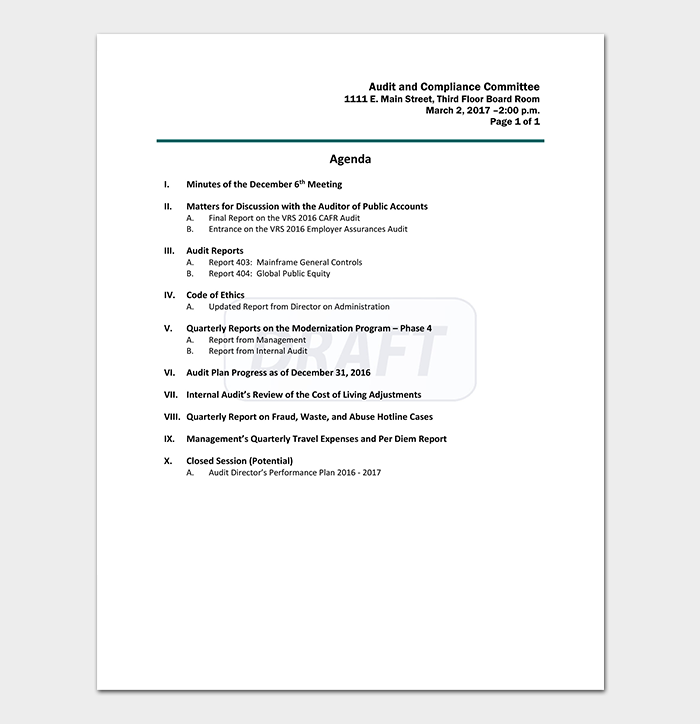 An audit planning meeting agenda is basically the list of items to be discussed in audit planning meeting. 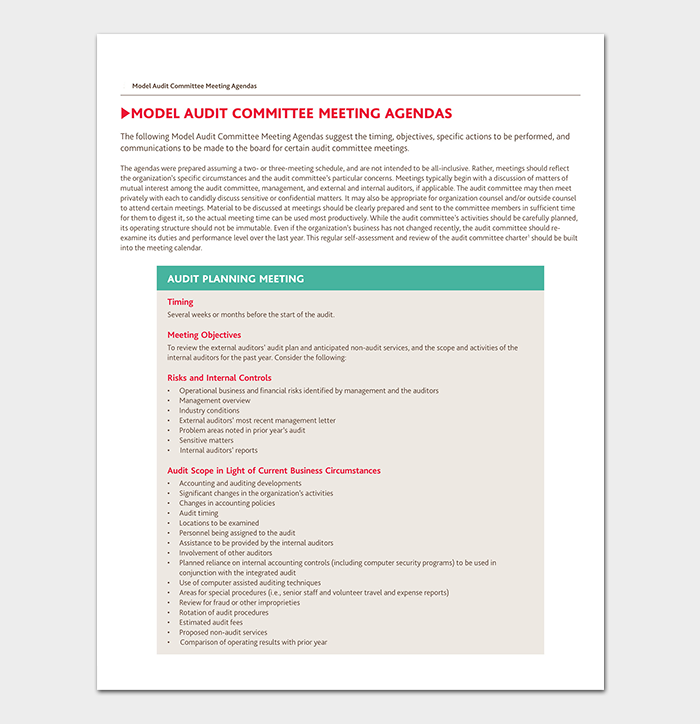 Such a meeting is normally scheduled to plan and discuss about the auditing process and help the auditee in preparing for the auditor’s approach to the process. The goal here is to avoid problems down the line when the audit is in progress. The auditor is informed about the firm’s background, associations etc., so that the audit is held the best way possible for both the parties. 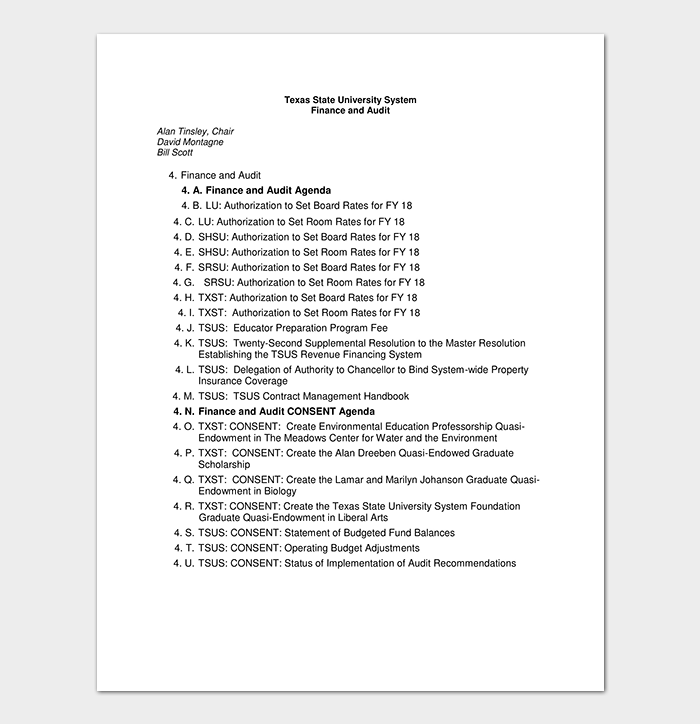 The terms of the engagement letter which states what the responsibilities and obligations of each of the two parties are is also finalized in an audit planning meeting. 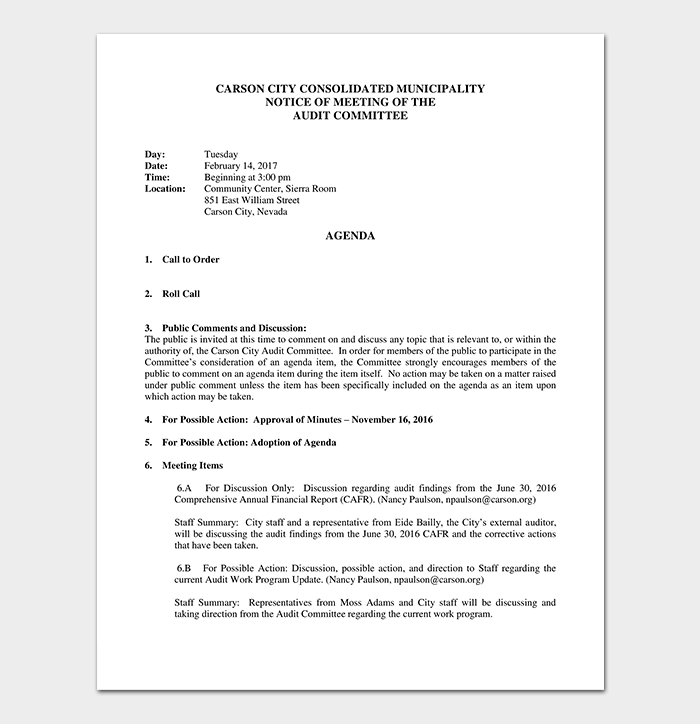 The meeting agenda ideally should cover changes in structure, operations, people employed, and systems followed, since the last audit. Such a meeting is usually led by the most experience person on the auditing team. 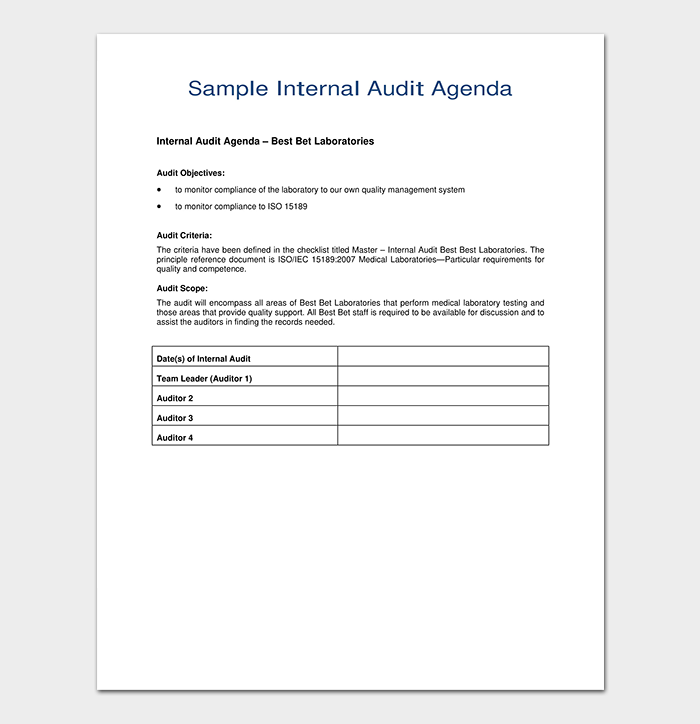 An internal audit is performed by a team that reports to the auditee organizations senior management and its board. Its primary purpose is to report about the firms functioning and suggesting steps to improve the organization’s operations to the management and the board. 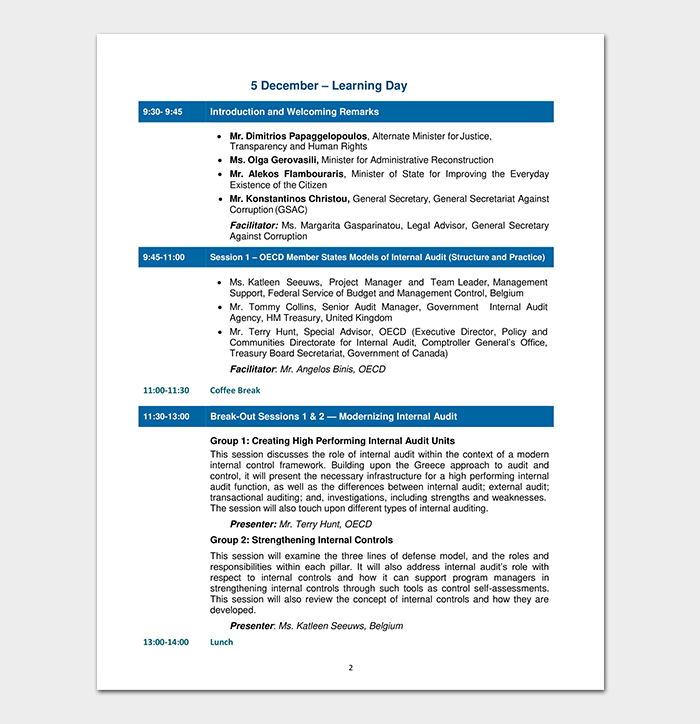 Such a meeting covers a broader area within an organization’s functioning from risks and problems in management to production. On the other hand, an external audit reports to shareholders, members of the organization etc., who are outside the firm’s governance structure or even to the government. The coverage of the audit is mostly limited to the financial reports & records of the auditee. The auditor in this case is not accountable on improving the auditee firm’s structure or processes and their responsibility is limited to just reporting on what they found. As the results expected are different in each case, an internal audit meeting’s agenda will be different from that of an external audit. 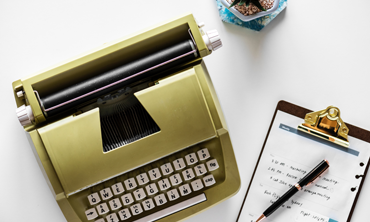 For instance, an internal auditor will be interested in a firm’s current strategy for sales growth, while an external auditor would be concerned with how the form plans to invest in that front rather than about the process itself.